The first time I came across a ‘Fantasy Coffin’, or ‘Proverbial Casket’ was just after my film was released about Sir Paul Smith’s unwrapped and unusual objects he had been receiving through the post for the past 20 years from a mystery person. I was looking on Paul’s blog and I noticed that he had a picture of a Mercedes Benz coffin. I read his blog with interest and it turned out to be an exhibition at the Jack Bell Gallery, London. I quickly attempted to discover more about these fascinating coffins, to see if I could get some details of who made them. 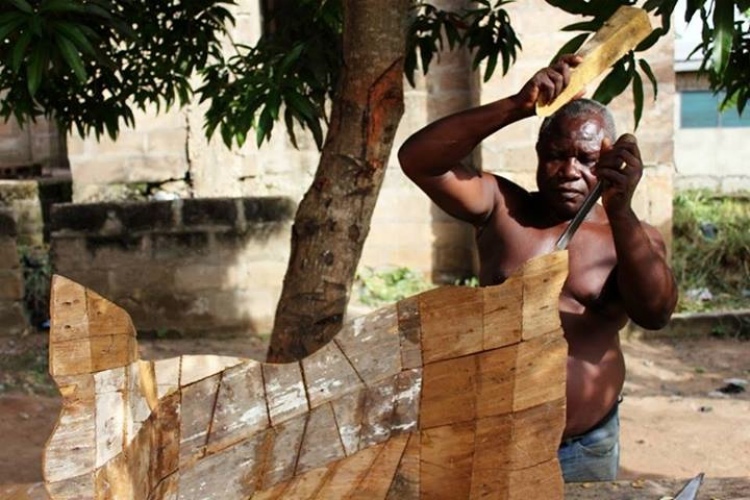 Jack told me, “Paa Joe the greatest living Ghanaian Coffin Maker made them”, and gave me his contact details. The Ghanaian Fantasy coffin movement is a relatively new tradition that has said to be originated around the 1950’s after the Ga people had started to use palanquins for coffins. A palanquin is a carved wooden object that the chief is carried around the village on the shoulders of men from the tribe. The coffins are used as an opportunity to fulfil a dream that they were not able to achieve in life, or pay tribute to someone’s character or representative of someone’s profession. Many different coffin shapes have been built in the past, including lions, fish, chilli peppers, Coca Cola bottles, cameras and cars. You name it and they have probably built it. The coffins have been exhibited all around the world and have been featured in programmes in the past. They’ve even been exhibited at Nottingham Castle around the year 2000. I’m fascinated by the objects because they have an inherent meaning or story that is within the object. The coffins, for me, have this layer of concept or story from the individual who it represents. The ephemeral nature of the object is also very powerful; after months of carving and building they are buried in the ground even though the paint may still be wet. This for me has a resonance and captures the idea of life and death in one object. I built up contact with Paa Joe and his son Jacob over email for a few months and was able to get a small amount of money from EM media, before they were made extinct by the conservative government, to help pay for flights for a research trip. I flew to Ghana on my own armed with my camera and tripod. After a long flight, and a very long bumpy drive on a road that was in mid-construction, I reached Paa Joe’s workshop a few hours outside of the centre of Accra. At that first meeting Paa Joe burst out in infectious laughter and put his arms around me. He is a great man, you can feel his presence and his ability and skill is astonishing to see. I know now, that he looked at me as some kind of salvation. I was here to make a little short film like ‘PS Your Mystery Sender’ I thought, but I quickly realised that despite the fact he was exhibiting at the V&A, the Southbank and the British Museum over the space of just a few months, he had actually found himself on seriously hard times. I discovered that Paa Joe used to have a workshop in the centre of the funeral district but a few years ago because of complicated land ownerships he was forced to move to a storage hut outside of the city on a busy main road. On that first trip Paa Joe said to me, “I want to come to the UK to make a coffin”; I thought this was a great idea but had absolutely no idea how I would implement such a request. I returned to Nottingham, edited a trailer and asked local producer Anna Griffin to team up with me writing some documentary scheme applications. We were selected for the Documentary Campus Masterschool, a prestigious development scheme where 16 participants are chosen from around the world and each project taken through a serious of workshops with industry experts. I returned to Ghana with the help of the worldview fund and Creative England and we developed the pitch further in order to present it in front of 50 commissioning editors from broadcasters from all around the world at Leipzig film festival. We had the idea of working with the National Trust New Art Strand to bring Paa Joe over for an artist residency. We put together an Arts Council Application for Paa Joe to build his most perfect lion coffin as artist in residence at Clumber Park, working with City Arts and Nottinghamshire County Council. Vic Fearne, a local coffin company, donated some beautiful wood for the coffin and we built a great project. We had a very successful 4 week long project which was seen by thousands of people. I created a finale celebration that was influenced by the Ga funerals and their beliefs with Jacob and Paa Joe; an unusual spectacle featuring dancers, Sabar Soundsystem drumming, fire spinners and culminated with the lion coffin crossing the water to the land of the afterlife. After three months of editing we’ve reached the stage where it’s time to bring Paa Joe’s story to a fitting end. Paa Joe had wanted to come to the UK in order to earn some money to move his workshop back to the centre of Accra so he can be remembered and leave a legacy for his son Jacob. I need to take one final trip back to Ghana to discover if he’ll be able to achieve his goal. Like many independent filmmakers, musicians and inventors before us, we have turned to Kickstarter campaign in order to try to raise the funds we need to complete the film. The campaign runs until 12th November so if you are interested in really cool perks or just want to support independent film – please make a donation and/or it share with your friends. Looks like a great project and fascinating subject for a documentary. Thanks for sharing – and good luck to Ben and his crew!